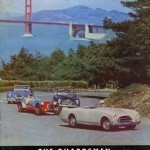 By 1952, British Motor Car (BMC) Company of San Francisco California Was Offering Some of the Finest Foreign Cars Available On The West Coast. 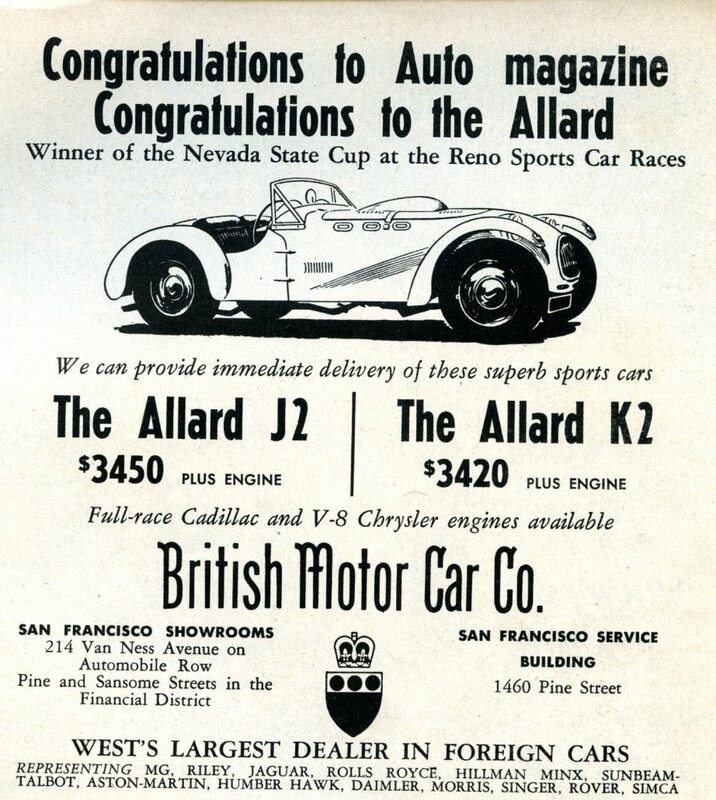 In This Advertisement, Allard J2's and K2's Are For Sale - With Full-Race Cadillac and V-8 Chrysler Engines To Boot! When Rick D’Louhy and I first located information about the BMC sports car on a Singer (UK) chassis, we thought it was a foreign make and filed it in our “future” studies folder – for when our research turns to “Forgotten Foreign Fiberglass” (I love alliteration). We couldn’t have been further from the truth. While the chassis’ may have been from the Singer Motor Company of England, the bodies were purely American – by design and build. This rapidly changed our perspective and off we were on another research scavenger hunt. I noticed the mention of your book on Richard Parks newsletter. 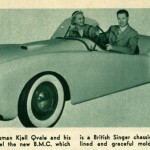 I worked for Kjell Qvale (pronounced “shell” (Kjell) “ka-vah’-lay” (Qvale)) British Motor Car Distributors back in 1954. I worked for him for over 25 years. When I moved to Seattle, Washington in 1956 for him, I know that the body mold was still at our warehouse near Fisherman’s Wharf in San Francisco. The BMC Fiberglass Bodied Singer Debuted As Part Of The Opening Activities for the Memorial Day Race in 1952 at Golden Gate Park in San Francisco California. Kjell was going to use Singer car chassis I remember and the first car they built was raced at Pebble Beach by the fellow who the crash helmets tests were named after – “Snell.” Just curious what you have on that car. I look after an Automotive library for a man in the Northwest. 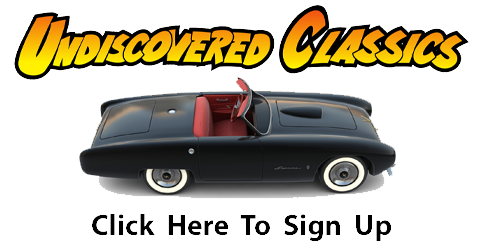 Obviously we had the notion of BMC all wrong, and we needed to turn our attention to this company as part of our research for “Forgotten Fiberglass.” Back in 2007, fiberglass body companies seemed to be coming out of the woodwork as we began perusing magazines. So here was another challenge for Rick and me. Look up William Pete Snell Foundation. 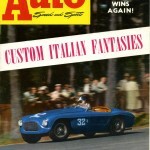 He had the BMC car at Pebble Beach Races in around 52/53. Very few people are left from that period that might have some memory about how Snell ended up with the car. When he (Snell) crashed it was not the BMC car – to the best of my memory. 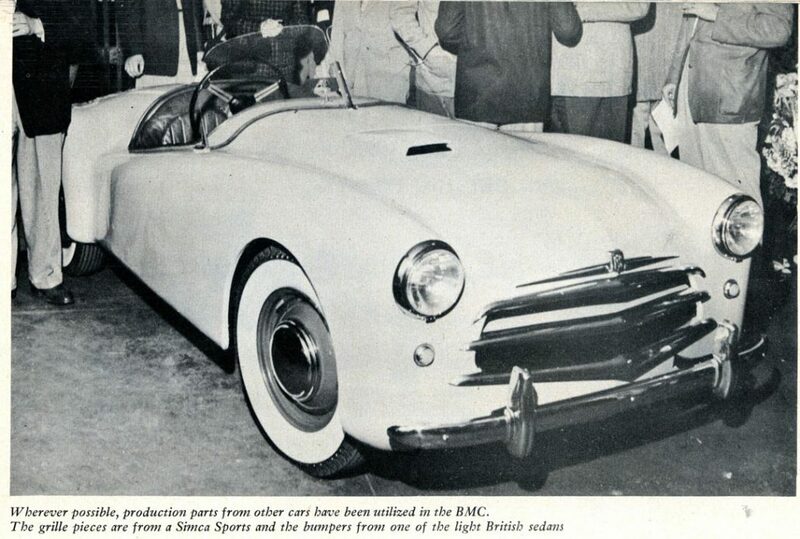 British Motors Cars had a used car operation in Walnut Creek in the east bay and I think that’s where Qvale’s BMC fiberglass car ended up. The BMC company of San Francisco is the company I worked for and part of the Qvale organization. As I recall, Qvale was going to buy the Singer chassis from England and install his own body on them. Smart Looking Car. Caption For Photo Read: "Wherever possible, production parts from other cars have been utilized in the BMC. The grille pieces are from a Simca Sports and the bumpers from one of the light British sedans." Also as I said earlier–the mold was in San Francisco. Qvale is 88 years old now-in great health (2007). BMC of San Francisco ( British Motor Car Distributors Ltd.) was the distributor of Morris Cars, Austin of England, sold Singers, Allards, Jowet Jupitors, Jaguars, Rover, Rolls Royce, and other British Cars. About 52/53 Morris and MG merged to form British Motor Corporation in England – Qvale’s company British Motor Car Distributors became a distributor on the West Coast north of – but near – Fresno. Qvale ended up as Distributor for 11 western states. I don’t think BMC in San Francisco made very many fiberglass bodied cars. I think the idea was that if you had an accident you could throw the original body away and get a new one to replace the damaged one. 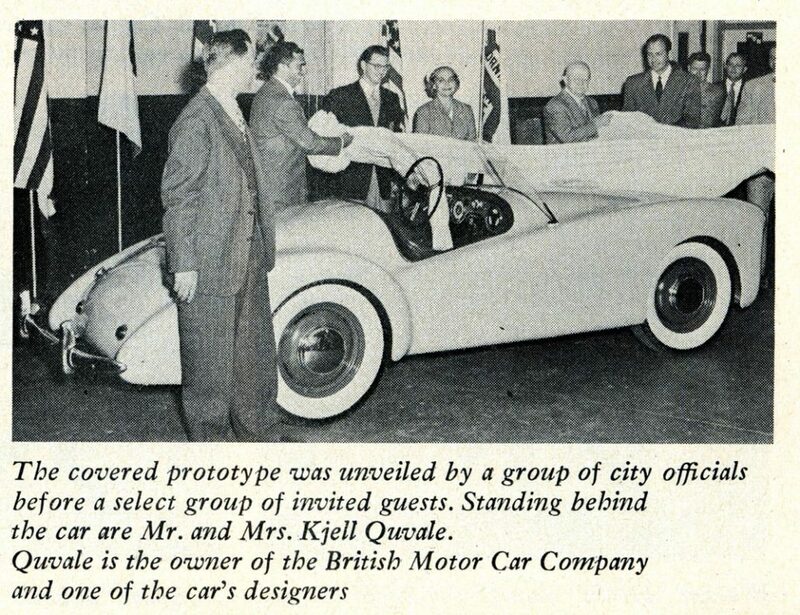 Here The Caption Reads, "The covered prototype was unveiled by a group of city officials before a select group of invited guests. Standing behind the car are Mr. and Mrs. Kjell Qvale. 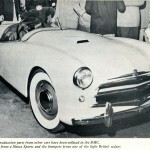 Qvale is the owner of the British Motor Car Company and one of the car’s designers." 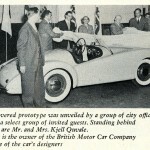 As a prelude to the Golden Gate Park Road Races (Memorial Day, 1952), the always progressive British Motor Car Company of San Francisco presented their prototype sports car. 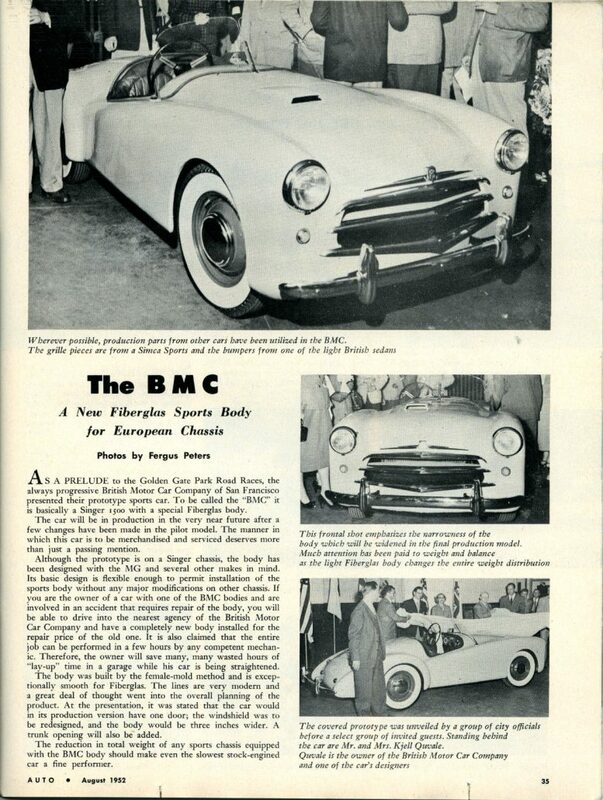 To be called the “BMC” it is basically a Singer 1500 with a special fiberglass body. The car will be in production in the very near future after a few changes have been made in the pilot model. The manner in which this car is to be merchandised and serviced deserves more than just a passing mention. Although the prototype is on a Singer chassis, the body has been designed with the MG and several other makes in mind. Its basic design is flexible enough to permit installation of the sports body without any major modifications on other chassis. If you are the owner of a car with one of the BMC bodies and are involved in an accident that requires repair of the body, you will be able to drive into the nearest agency of the British Motor Car Company and have a completely new body installed for the repair price of the old one. It is also claimed that the entire job can be performed in a few hours by any competent mechanic. Therefore, the owner will save many, many wasted hours of “lay-up” time in a garage while his car is being straightened. 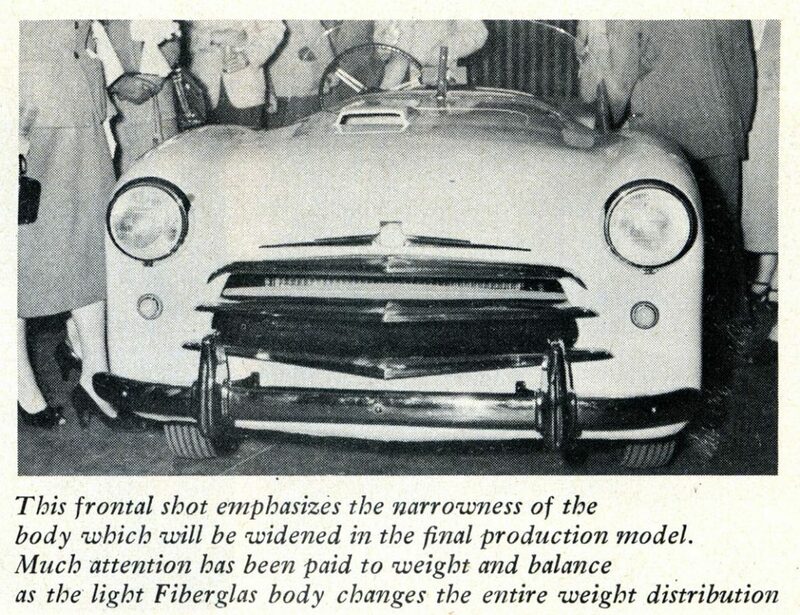 Here The Caption Reads: "This frontal shot emphasizes the narrowness of the body which will be widened in the final production model. 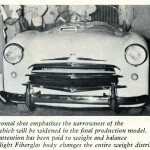 Much attention has been paid to weight and balance as the light Fiberglas body changes the entire weight distribution." The body was built by the female-mold method and is exceptionally smooth for Fiberglas. The lines are very modern and a great deal of thought went into the overall planning of the product. 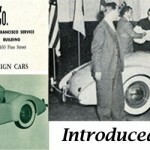 At the presentation, it was stated that the car would, in its production version, have one door; the windshield was to be re-designed, and the body would be three inches wider. A trunk opening will also be added. The reduction in total weight of any sports chassis equipped with the BMC body should make even the slowest stock-engined car a fine performer. 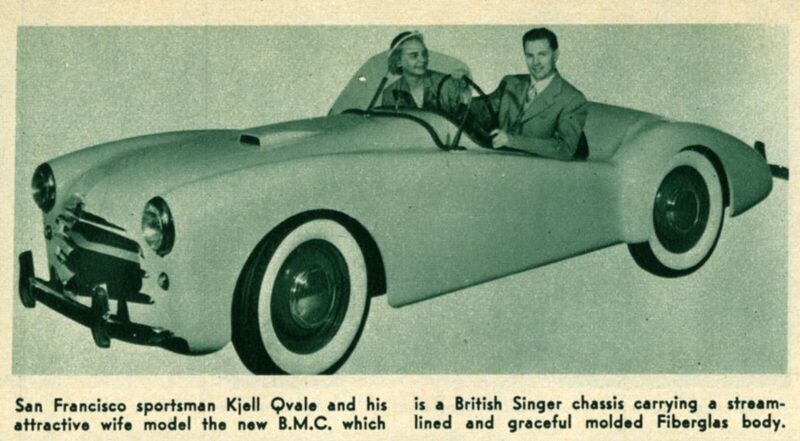 This Photo Appeared In The September 1952 Issue Of Road & Track With The Following Caption: "San Francisco sportsman Kjell Qvale and his attractive wife model the new BMC which is a British Singer chassis carrying a streamlined and graceful molded fiberglass body." 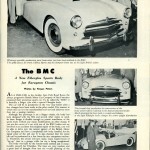 The BMC was finished and debuted in May 1952. 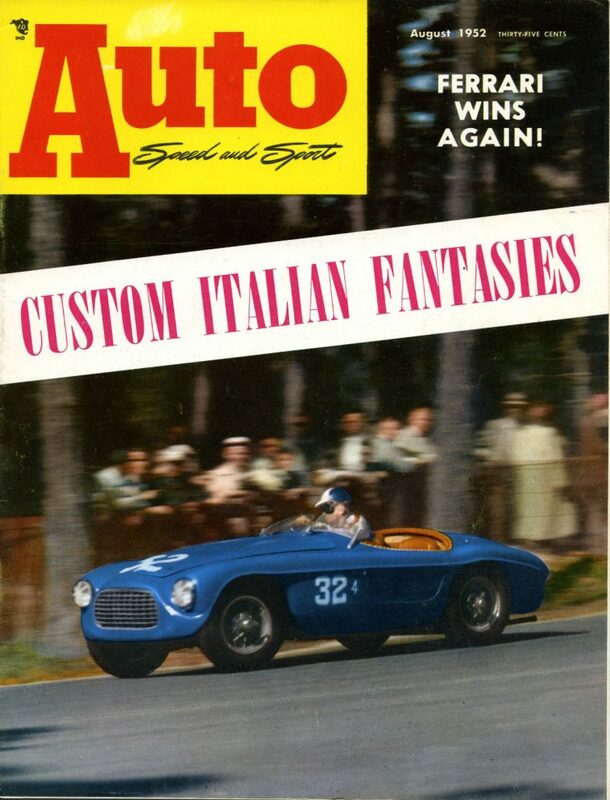 Think of how early this was gang….Glasspar had debuted their sports car just 6 months before. Kjell Qvale burst forth with his designed and finished car in just 6 months – and was nearly ready to go into production (more about that later). Most all of the others – if not all of the others – were not a “replacement body” approach for an existing car. Kjell Qvale and his team of entrepreneurs really had an innovative approach. Time would tell how successful he would be. That’s our first segment on the BMC Prototype fiberglass sports car. The next part of this story will focus on an interview with – and memories of – Kjell Qvale – who will be 92 years young this year (2011). Wait until you hear what he has to say. 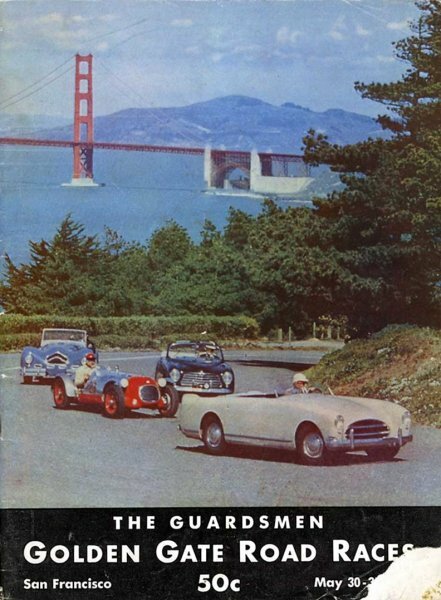 By 1952, British Motor Car (BMC) Company of San Francisco California Was Offering Some of the Finest Foreign Cars Available On The West Coast. 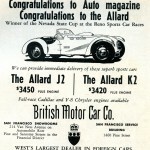 In This Advertisement, Allard J2’s and K2’s Are For Sale – With Full-Race Cadillac and V-8 Chrysler Engines To Boot!